I think of the cable as an elemental part of knitting, perhaps because the pattern abbreviations tend to look like fugitives from the periodic table (P2K4C2P2), but really, because the cable is one of knitting’s core elements. The cable plays an architectural role in knitting at once an intrinsic building block and a decorative element. Something so basic to knitting, I felt, must have a long history. The real history, we don’t know, but the recorded history is rather recent. The Oxford English dictionary dates the first mention of cable knits to 1882 (in Sophia Caulfeild & Blanche Saward’s Dictionary of Needlework, 1882). Richard Rutt dates the first printed reference to knitting patterns earlier, to 1844 in his History of Hand-Knitting, 1987. All early references lead—surprisingly—to American sources, and point (as does common sense) to the cable’s visual likeness to nautical ropes. Although we (or I, anyway) tend to associate cable knitting with Aran fisherman sweaters, Richard Rutt takes great pains to explain that the white, Irish pullovers we have all grown up loving were developed in response to a marketing effort in the mid-twentieth century. 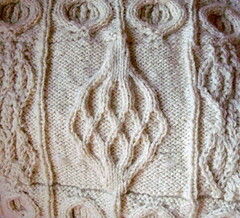 Even so, some of the most interesting cable patterns evoke a strong connection with Celtic design motifs. Alice Starmore’s examples in her Celtic Collection (1993) come to immediately mind. The “Girl from Auntie” (such an inspired name!) 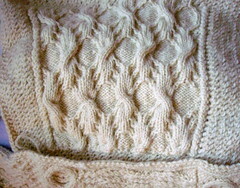 offers some wonderful celtic cable patterns on her site. 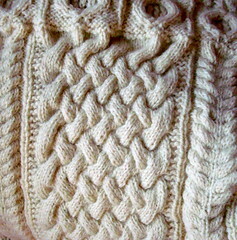 More recently, Nora Gaughan has gained recognition as the inspired queen of the cable, especially through her Knitting Nature, 2006. Her intricate cable patterns make even the most die-hard colorist quiver with delight at her incredible sensitivity to texture and architectural pattern. I wish I could offer a better example of a cabled letter here, because patterns and inspiration certainly exist. I just haven’t done any. The real paradigm for cabled letters can be found in Elsebeth Lavold’s work in charting cables for Viking runes in Viking Patterns for Knitting, 2000. For more details on her work, including a description of her recent exhibition, take a look at her site. A basketweave cable surrounded by seed stitch and lines of growing wheat to represent Millet’s archetypal Sower. He did many versions, but one of the best known is in the Boston Museum of Fine Arts, of 1850. This last square celebrates Standing Spinner (1850-1855, also in the Boston Museum of Fine Arts). It features a latticed spindle with small, circular spinning wheels across the top and bottom. That’s about all I’ve finished. This is going to be a small blanket of some kind at some distant date in the future. I guess that means I'd better start working on "D!" Thank you so much. As you can tell, I'm a big fan of your blog, & especially love your Bohus entries.